As you work your way through the buying process when choosing a new email vendor or ESP, you will get to the point where you want to see the platform live: the demo. Why plan an email marketing demo? Would you buy a car without test driving it first? (OK, I’ve done that, but only for a vintage car halfway across the world… doesn’t count!) I would never buy a family car without test driving it first. Nor would you sign a contract with a new ESP without seeing a useful demo of the platform first. This is, of course, after you’ve narrowed down the field to at least a short list. The demo is where the pedal meets the metal. It plays a key role in the vendor selection process. Take it seriously. But a canned demo won’t do. You need to see more detail than a canned demo will show you. In our experience at ClickMail, nine times out of 10 when a client comes to us unsatisfied shortly after having moved to a new ESP, it turns out that they didn’t dig in deep enough to make sure the platform could do what they wanted to do. They settled for the canned demo and only realized later that they should have asked to see more before signing a contract with that ESP. A canned demo is okay as a starting point. You can accept a general demo to get a general impression. However, you can’t accept a canned demo as a “good enough” representation of whether the platform can meet your functionality needs. 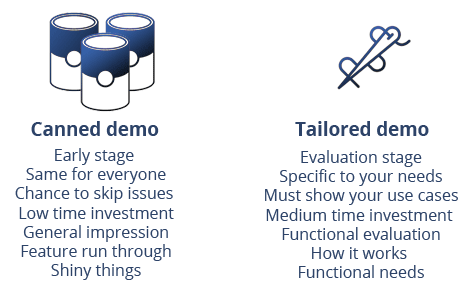 If the ESP only wants to show you canned demos – meaning the demos they choose to show that are the same for every prospect – ask to see a demo specific to your needs instead. The problem with the canned demo is that it is controlled by the sales person, who is showing you what he or she wants to show you, while that is often not the whole story. These kinds of presentations are often also very smooth, as if they have done it dozens and dozens of times (which they probably have). And there might just be a man behind the curtain. If they can’t or won’t show you a demo based on one of your use cases, it’s time to step back from the negotiating table and focus on the next ESP on your short list. To really learn from the demo stage of the process, give the ESP three use cases that are specific to your email marketing program today, or things you want to be able to do in the future. Ask them to demo those use cases for you. Try to make one or two of them more complicated, and set five parameters for each and some rules. Tell the ESP to literally show you how it can be done using their platform. And ask a lot of questions. Don’t make assumptions. Those use cases might be automated and triggered email programs, segmentation, automated testing, personalization and dynamic content, or something that has annoyed you with your current system. Remember, you’re going through the demo stage because you’re still comparing email systems to determine which one is the best email marketing software for you. Be very wary of these red flags! Let’s say you walk into a car dealership for a test drive, but the salesperson wants you to sit in front of a computer screen and watch a simulated test drive instead. Will that satisfy your need to feel how the car handles? How it brakes, turns, accelerates, maneuvers? Not at all. What if the salesperson at the car dealership let you get into the car, but only on the passenger side, and they insisted on doing the driving? Would that count as a test drive in your mind? No, it wouldn’t. 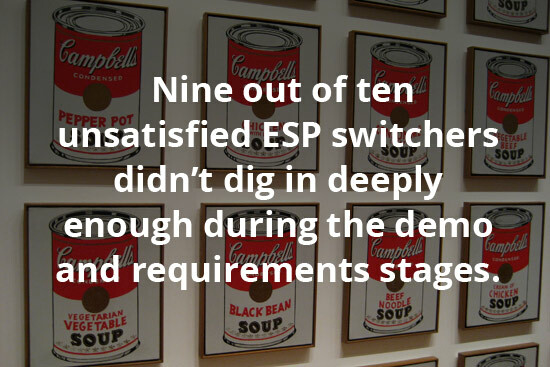 In a similar way, you can learn a lot about the ESP platform if you can actually test drive it. See if you can “get the keys” for a couple of days. Let key users give it a try—your programmers, IT department, creative people, email staff—whoever will be using it should get a chance to give feedback. When you access the platform, make sure a test set of your data is accessible for segmentation, automation, and personalization. Try to make an email or set up an automation. Send trial emails internally or to your seed list to go through the whole process. One (big) caveat to this: There is a risk that because you won’t be fully trained on the platform, so you might assume you can’t do a particular task when in reality it’s only that you don’t know how to do it. Be aware that you don’t know exactly how to “drive” this platform and ask the ESP if you need help figuring it out. Just as you’d insist on a real test drive of that new car, you should try for a real test drive of that ESP platform—or at the very least, some very specific use cases pertinent to your email marketing program and goals. And no matter what, do not except a canned demo as a real representation of what the platform can or can’t do.